Finding specialist swimming sessions for children with Special Educational Needs and disabilities can sometime be difficult. Here you'll find information about all disability swimming session in stockport. We cater for everyone, from parents & babies, toddlers, junior swimmers through to adults learning to swim. Group swimming lessons: Small groups of up to 6 swimmers can enjoy a fun orientated 30 minute lesson taught by a fully qualified ASA Level 2 swimming teacher and assisted by volunteer staff. 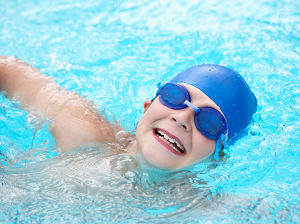 Our unique lessons are conducted from in the water to support when required and improve the learning process. Costs are £8.25 per 30 minute lesson held weekly during school term time, usually 12-13 weeks, and are payable termly in advance. 1:1 or 2:1 swimming Lessons: These lessons allow for 1:1 or 2:1 instruction by our fully qualified and experienced staff who can support any swimmers. This is a great way to work towards the specific needs of a disabled swimmer. Costs are £14 for 1:1 support per 30 minute lesson or £21 for 2:1 support. Lessons are weekly during school term time, usually 12-13 weeks, and are payable termly in advance. Free Disabled Swim Sessions at Local Pools. There are also a number of swimming lessons/session for children and young people with Special Educational Needs and Disabilities. Please contact each provider for more information. Poynton Leisure Centre: Yew Tree Lane, Poynton SK12 1PU Monday 12:00 to 13:00 Except Bank holiday and August. Check with Leisure Centre about September onwards. Avondale Leisure Centre: Heathbank Road, Edgeley. Every second and forth saturday of the month, 17:00 to 18:00. More information contact 0161 477 4242. NB - All pools have a hoist and steps avaliable for easy access to the pool. Please contact the pool before turning up on the day.